POD is a common word in the field of transport movement of goods or documents which means Proof Of Delivery. POD is simple and common terms.POD in imports means Proof of Delivery of goods to the final consignee. Once after arriving goods at the destination of importing country, the cargo is customs cleared by necessary documentation and inspection procedures and formalities where ever applicable as per government requirements of each country. After completion of customs formalities of importing country, the cargo is handed over to the final consignee by carrier after collecting necessary dues if any. The delivery of cargo to the consignee can be at port, or up to the consignee’s premises depends up on the terms of delivery agreed between him and his supplier of goods. For all imports where in terms of delivery is DDU (Delivery Duty Unpaid) or DDP (Delivery Duty Paid), POD (proof of delivery) must be collected by carrier or his agent as a proof of handing over back the cargo to the consignee. Proof of Delivery (POD) contains the details of cargo delivering to the consignee with all necessary reference numbers. While delivering goods, consignee or his authorized representative signs with name and affix rubber stamp on the said POD and returns back to the carrier or his representative who authorized to deliver goods. 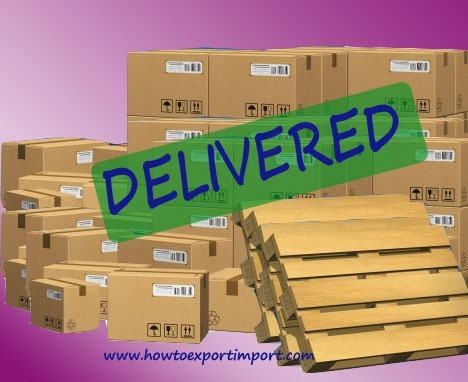 The POD (proof of delivery) contains the quantity, number of packages, description of cargo, invoice number and other reference numbers pertaining to the said import shipment, date and time of delivery etc. If cargo delivered through transport, the vehicle number is also mentioned in Proof of Delivery (POD). The details of POD can be arranged as per the requirements of supplier of goods overseas. After collecting POD Proof of Delivery of goods from the final consignee, the said document will be sent to the shipper. This POD (Proof of Delivery) helps shipper to have a record on delivery of said import shipment to his overseas buyer. Proof of Delivery may also helps supplier of goods to follow up for his payment with his overseas buyer, if the payment term is based on ‘receipt of goods by buyer’ or ‘payment on delivery of goods’. The term POD is also known as Port of Discharge. I hope, I could explain you this simple term – Proof of Deliver POD in easy language. Would you like to share more with your experience in POD – Proof of Delivery? Write below your thoughts about POD – Proof of Delivery. Oromo: On 31 July 2015 I am the new employee of the growing importing trading company in Ethiopia as a procurement officer and the notification and following up of the supplier up to the good is delivered and cleared from the custom is my duty as given by the manager of the company. from your above blog, I accumulated the necessary information which will enable me to exercise my responsibility in the company.therefore; I thankfully tell you your page is helpful for a person like me. thank you and do not dry your source of information. SUMIT: On 20 October 2016 Should an Importer submit copy of Highseas sales agreement to the Bank alongwith Bill of Entry?